Here is a picture of Kaylee's new hairdo - we let her hair grow out to keep her warm during the Minnesota winters. She loves the snow. 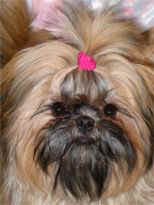 Kaylee is a Shih Tzu, which was originally bred the Himalyan mountains and is one of the oldest breeds in the world! She loves, loves, loves the snow. We dig a huge snow path in a "crazy 8" pattern through our backyard so she can bound around outside without being over her head in snow drifts. Kaylee is Dad's 4th Grand-dog after Gizmo, Capone, Emma. What is Kaylee Thinking in this photo? : "It's hard work to be this adorable"
She officially weighs in at 8.5 lbs so she is really tiny (but fluffy) for a Shih Tzu. - knows how to "sit"
- knows how to back up "back"
- just recently learned how to "high five"
Let me know what you think of her new hairdo!